This story originally appeared in the March 27-April 2, 2015 issue of the DP Times. It is being re-posted in honor of Earth Day. With an end to the drought nowhere in sight and water supplies dwindling as a result, the South Coast Water District added a Water Saver of the Month Award program to complement the district’s conservation rebates already in place and provide an added incentive to projects that don’t qualify for existing rebates programs. The program was approved for a pilot period of six months by a unanimous vote of the SCWD directors at their Jan. 8 meeting. Nominations for the monthly award—by SCWD staff, homeowners or neighbors—should be submitted to the district’s customer service center. Applicants under current rebate programs are not eligible. For questions, the customer service department can be reached at 949.499.4555 or custserv@scwd.org. 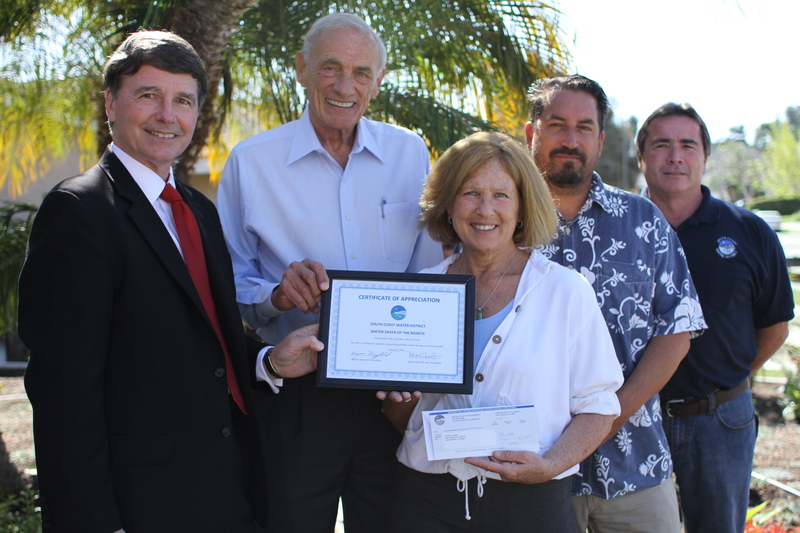 The first-ever $500 check and certificate of appreciation was presented to Donna and Henry Scimia on Priscilla Drive on Tuesday, by SCWD’s General Manager, Andy Brunhart; Larry Fregin, reclamation/water use efficiency supervisor, along with Directors Wayne Rayfield and Rick Erkeneff. The Scimias were chosen as the winners for January for front yard landscaping with drought tolerant and native plants. Scimia said the couple started in November and completed the project at their convenience. Native and low water succulents and other plants were arranged in beds around the perimeter of the yard and the central patch that used to be a lawn was planted with a groundcover called dymondia, native to South Africa (where the climate is similar) and when filled out will require no more than a short watering once a week. The Scimias have made water conservation a part of their everyday lives—for example, doing laundry and dishwashing after 9 p.m., hanging clothes outside on a line to dry—and their water bill has dipped to below $15 a month as a result, despite having a large back yard that is yet to be converted to drought tolerant plants. Rayfield praised the couple’s work on their front yard and thanked them for setting a good example for the community. Scimia confirmed that her neighbors are taking notice. Erkeneff also congratulated the Scimias on a job well done and taking the initiative to change their water use habits.